Hey, Justin, nice cabinet | Blog? What blog? Politics is not my best topic, but here I go anyway. But then, this topic is something that affects me personally, so maybe it’s not just about politics, after all. For those not aware, Canada’s Prime Minister, Justin Trudeau, was sworn in yesterday and his new team of cabinet ministers was announced. 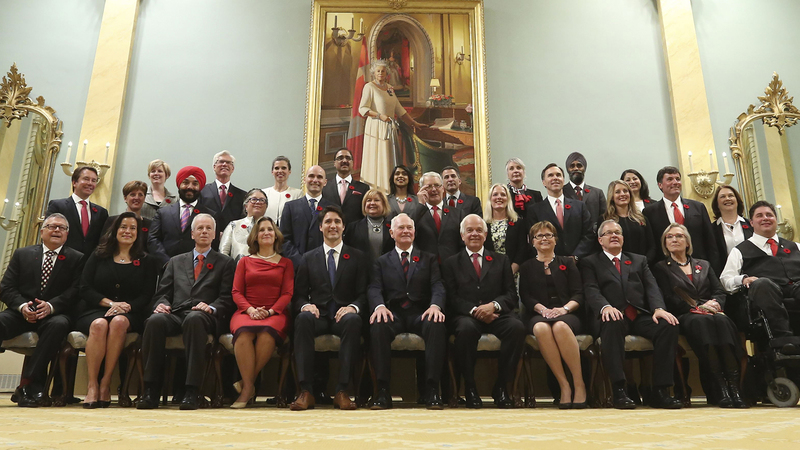 Prior to yesterday, Trudeau declared that his cabinet would consist of 50% women. What we now know is that the group also consists of several visible minorities, including 2 Sikhs, 2 aboriginals, and 2 individuals with physical disabilities. In fairness, it should be pointed out that there was diversity in the previous cabinet, though not as much. This was the first time, however, that the incoming Prime Minister had declared his intention to establish gender parity. This morning on The Current, I heard a guest say that she wished that the PM hadn’t announced that his cabinet would be half women, that it should have simply been that way, without him having had to say. While I get what she’s saying — that equal representation should be the norm — I also think that Trudeau’s announcement signals a commitment, and making a big deal about it increases the buzz and gets people talking — and thinking (like I am now). I used to be against affirmative action. As a minority on 2 counts, I felt that it was insulting to be chosen based on what I looked like, rather than merit. Today, I feel differently. My 10 year-old daughter gets annoyed by how often I point out the lack of diversity wherever we are, whether it’s at a public event, her school, or looking at advertisements. But it is because of her that I do this. I think about how not seeing people who look like her affects her own sense of belonging. Though, I’m not as worried about that as I am her sense of ambition. In the past few years, I have been in career exploration phase. In researching various companies in my field (marketing/advertising), when I look at the “About Us” section of organizations’ web sites, it is not unusual to see an all or mostly white group, often mostly men as well. I believe that these companies have hired who they think are best; what I’m hoping is that Trudeau’s move will encourage them to consider candidates outside their usual circle. Further, I’m hoping that they will make an effort to seek out more female and ethnically and otherwise diverse individuals to fill their team rosters. Ultimately, what I’m really hoping is that when my daughter is in her own career exploration phase, she will be able to see herself among the senior influencers of any organization, be that private or public sector, so that she’ll know that there is a place for her there — and way beyond. That’s because they’re wearing coloured contacts. I’m pretty sure at one point in our acquaintance, you wore Birkenstocks, had a beard, and often wear plaid, so yanno.